Rainbow Valley is now on Facebook! We are now on Facebook thanks to Nikki - click here to visit our page and see some more photos of the Rainbow residents! We are very, very sad to report that two of our ponies have been recently found dead. Hettie was found on the morning of Thursday 17th October, and Pippin was found exactly one week later on 24th October. Both had very bloated, gassy stomachs. An empty bag of dried dog food was found close to Hettie, together with a dog lead. While we do not know for certain that the food is linked to their deaths, the situation is being treated by police as suspicious as whatever happened took place during hours of darkness, in a quiet location which is not accessible by vehicles. We are praying that this does not happen again. If anyone has any information please contact Linny in the first instance (details are at the foot of this page). RIP Hettie and Pip - two of the least-deserving ponies for this ending. These three friendly goats are looking for a new home - currently in Branscombe, East Devon. See our goat re-homing page for more details. The is an update on the goats advertised for re-homing on 13/08/2013. The females and kids have found new homes, but poor Charlie is still available and in urgent need. See our goat re-homing page for more details. A new home is desperately needed for two Anglo-Nubian milking nannies. See our goat re-homing page for more details. 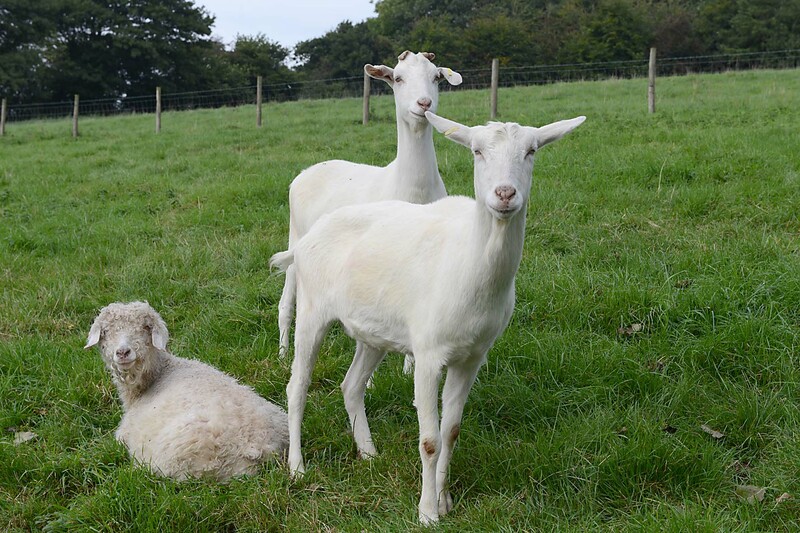 Three goats and two kids are in urgent need of a new home - Gunnislake area, Cornwall. See our goat re-homing page for more details. 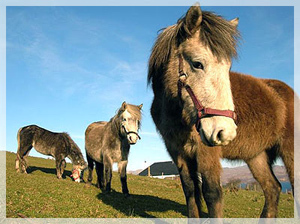 16/07/2013: Ponies seeking a home - can you help? Two ponies are in need of a kind, experienced new home. The first is a 7 year old Dartmoor mare, chestnut, 12hh, long reined and backed but needs bringing on. Her companion is a 3 year old Dartmoor X gelding, bay, 10-10.2hh, and apparently adorable! Both ponies are loving and good in all ways - currently located in Hatherleigh. If you can offer a new home please contact Patty on 07765 153183. A lovely home is being offered in the Bath area for two goats. See our goat re-homing page for more details. 02/06/2013: Goats for re-homing, and Amber is still looking for a new home! Pinky and Perky are looking for a new home together. See our goat re-homing page for more details. 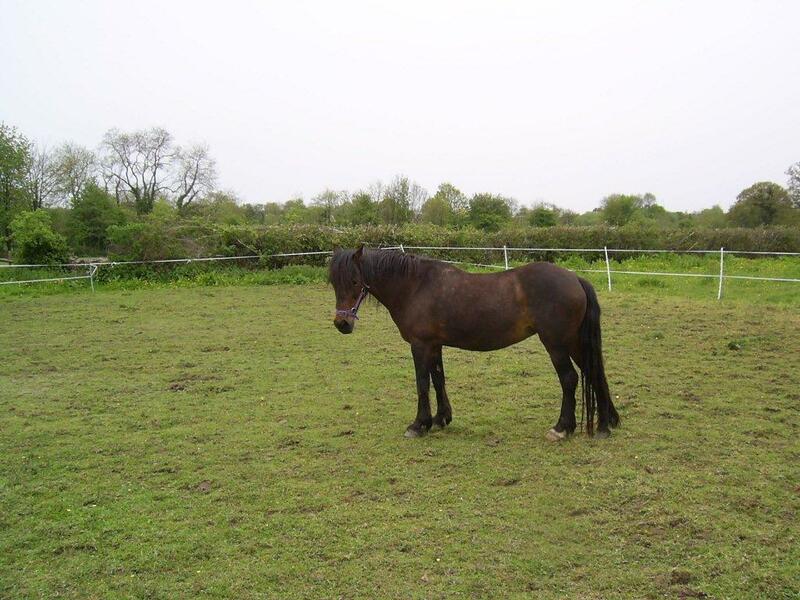 Amber the Welsh-type mare is also still looking for a home - see our earlier bulletin of 26/04/2013. Her current owner has sent us this photo - please contact Bridget on 01884 841727 or email bridgetteporch@btinternet.com for further details. 21/05/2013: Can anyone help Elliot? Elliott is a 15 year old, 17.2hh German warm blood, and a retired Grand Prix dressage horse. He is described by his current owner as a very loving, gentle giant, and a pleasure to have around. Unfortunately he can no longer be ridden due to lameness caused by navicular disease. He is very easy to handle, and very kind - there is not a bad bone in his body, he loves being brushed and having fuss and cuddles. His current owner took him on when her employer passed away, but circumstances have now sadly changed and she can no longer afford to keep him. Elliot would love to find a loving forever-home as a companion. He will be greatly missed, but has so much life to live and love to give. He has worked very hard over the years as a top competition horse taking his riders and trainers to the top of the dressage discipline, and it would be wonderful if he could find a lovely home where he could retire and have a happy life. This is a genuine request for help. Elliot is based in Chumleigh, north Devon - for further information please contact Sophie on 07591 016618. 26/04/2013: Can anyone offer a home to Amber? Amber is a pretty bay Welsh-type mare looking for a new home. She is 12 years old and approximately 13 hands. She has been at her current home since April where she arrived in very poor condition, having been left out with a herd for five years. She is a good companion pony and has apparently been ridden, but is very nervous and her current owner does not have the time to spend with her to fully gain her trust. Click here to sign the petition "Delegation of the European Union to Russia: SLEDGEHAMMER USED ON HORSES " on Change.org. A female Golden Guernsey is in desperate need of a new home - can you help? See our goat re-homing page for more details. Have you seen a dog with a yellow ribbon on its lead? To find out what this means, click here - and forward the link to spread the word! Can you offer Bramble and Nana a new home? See our goat re-homing page for more details. Two friendly billies are in need of a new home with kind and knowledgeable owners - can you help? See our goat re-homing page for more details. Can anyone provide a 5* home to a mare in need? She's a 15.2 liverchestnut Dutch Warmblood, 9 years old with superb blood lines and a brilliant temperament. Unfortunately she cannot be ridden, but is suitable for breeding and would make a great brood mare. Please contact Julia on 07968 575082 for further details. Lucy and Nibbles need a new home - can you help? See our goat re-homing page for more details. Equine Touch Practitioner Cathy Daw will be giving a demonstration at the Dartmoor Pony Heritage Trust Open Day on Sunday 8th July. The open day will be held at Parke, Bovey Tracey, and runs from 11am to 3pm. 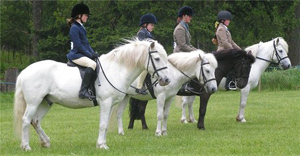 It is a family day out featuring a range of demonstrations, and aiming to help people understand the work of the charity and the amazing work that Dartmoor ponies do. There will also be ponies for sale. Please see the Dartmoor Pony Heritage Trust website for further details of this event. A home is urgently needed for a male Golden Guernsey X. See our goat re-homing page for more details. We are looking for a really good, kind and loving new owner for a 12.2 Dartmoor gelding whose elderly owner is having to give up. The pony is 18 yrs young, fit and healthy. He's Ride and Drive and is safe in the heaviest of traffic, and has a gentle nature so he's an ideal childrens pony (but has worked mostly in harness). Restricted grazing will be necessary in spring and summer. This pony is offered on loan with an option to buy. Please contact his owner only if you are seriously interested in offering a forever home. Contact Jackie on 07837 472250. Location DEVON. Can you offer Tom and Jerry a new home? See our goat re-homing page for more details. Herbie is a 2.5 year old registered Dartmoor in desperate need of a home - he will be put down by this weekend if a home can't be found. Herbie is 10.2 hands, currently black but will be grey at maturity, and needs a home with geldings only. He's fairly quiet and good to handle. If you can help in any way please contact Jo on 07899 827352 (Chudleigh, Devon) or email the sanctuary. We are very sad to report that Ghost, our beloved sanctuary cat, has passed away. Ghost arrived at the sanctuary over 15 years ago as a feral cat, but over the years became the friendly little chap we all came to love. He took his duties as chief greeter-of-visitors very seriously, and would always come trotting over the footbridge to welcome people when they arrived. Having become increasingly old and frail Ghost had been living at home with Linny since last winter. Although still spritely, he had developed a tumour and was put to sleep in Linny's arms. 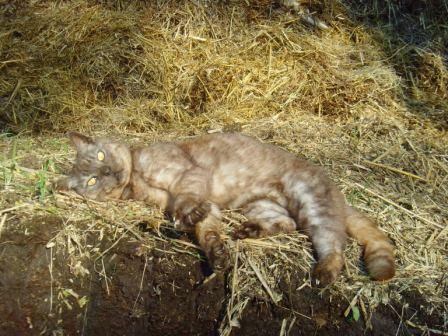 One of the things we will all remember most fondly was his knack for finding a warm spot to sleep - if there wasn't an available lap, the muck-heap would do! Would you like to give a little Pygmy goat a new home? See our goat re-homing page for more details. 29/11/2011: A big THANK YOU! Huge thanks to Mandy and Nikki for holding yet another hugely successful coffee morning, and for raising £600.90 for the sanctuary! Their hard work is much appreciated, and the money will go towards keeping the Rainbow inmates fed and cared for this winter. 22/10/2011: Support Rainbow Valley at the Animal Care Fair! ANIMAL VOICES TORBAY are holding an " Animal Care Fair" on Saturday 29th October 2011, 10am - 2pm at St Pauls Church,Torquay Road, Preston, Torbay. Admission is free and car parking is available. The venue is also on the Number 12 bus route. This is an animal awareness day with many stalls including tombolas, crafts, and cakes and tea (cakes made using free range eggs, of course!) Animal Voices raise much needed funds for rescues and struggling charities who are coping with the overwhelming number of animals being abandoned due to the effects of the recession. Rainbow Valley Sanctuary will have a stall at this event, so please come along and support us, and some of the other charities taking part which include Devon Feline Network, RSPCA, Boxer Dog Rescue, Devon Wildlife Centre, Badger Group, Quality of Life Sanctuary, and Cat's Protection. Two cute Pygmy goats are looking for a new home - see our goat re-homing page for further information. A home is needed urgently for two male Anglo-Nubian kids - see our goat re-homing page for further information. All too often, thousands of pounds in vet bills and the heartbreak of its death before the age of 12 months. If you believe the sale of puppies in pet shops and by dealers is wrong and even worse, fuels the evil puppy farm trade, are you prepared to spend about 60 seconds to send a message to those who have the power to do something about it? When Defra introduced the Animal Welfare Act 2006, they said they intended to use the powers it gave to introduce secondary legislation to replace the current Pet Animals Act 1951, which governs pet shop licensing. We suspect that our goat re-homing page is being browsed by someone (or several people) looking for goats for meat. At least two people using our re-homing service appear to have been targeted in this way. Please do not let this deter you from using our service as we have found wonderful, loving homes for many goats, but when approached by someone offering a new home ALWAYS ask for a vets reference, and make detailed equiries about the potential new home. It's galling for us that our service is being abused in this way, but we hope that by drawing attention to we'll reduce the risk of it happening in the future. Goats Galore sanctuary in Hereford and Worcester is dedicated to providing care for sick, mistreated, and unwanted animals. Their website has some great links to other goat rescue centres and societies. Why not pay their site a visit and find out more! .....then you might want to look at this link. The woman in this video is the 'queen of puppy farmers', but although she's in Australia she exports worldwide. Anyone contemplating importing a puppy from her should be very aware of where the dog is coming from, and the hell that is their life at Rutland Manor. Other websites of interest are Farms of Shame and Stop Rutland Manor. Help us fight this abuse! The loss of human life in the ongoing conflictst in Iraq and Afghanistan conflicts is terrible, but what about the plight of the animals? Nowzad is a charity set up by Royal Marine Sgt "Pen Farthing" to provide care for stray and abandoned cats, dogs and donkeys. Please visit the Nowzad website to find out more about their amazing work. The world needs more people who care like this! If anyone comes across a wild animal or bird that is injured or in distress, please contact the Devon Wildlife Hospital in Newton Abbot who will be able to provide the care and attention that the animal needs. Their emergency number is 07731 552909 and there is a dedicated Hedgehog Helpline on 07730 844954. Download a copy of our screen saver. Click on the link and install the exe file to your computer. Rainbow Valley Newsletter for December 2006. Please email me your feedback. If you have any questions that are not addressed on this website or need advice please contact Lin East on the number below. Rainbow Valley Sanctuary is not a dumping ground.